The Istanbul Research Institute Poster Collection is made up of a total of 408 vintage posters, 276 of them from the Republican Era and the rest from the time of the Ottoman Empire. The are posters in Turkish, Ottoman Turkish, French, and English, as well as other languages. The posters advertise various organisations and their merchandise. There are posters for companies such as Turkish Airlines, Sümerbank, Singer, Pepsi, as well as promotional posters containing Ottoman script and historical scenes. These posters allow social, cultural, and economic insight into the eras to which they pertain. 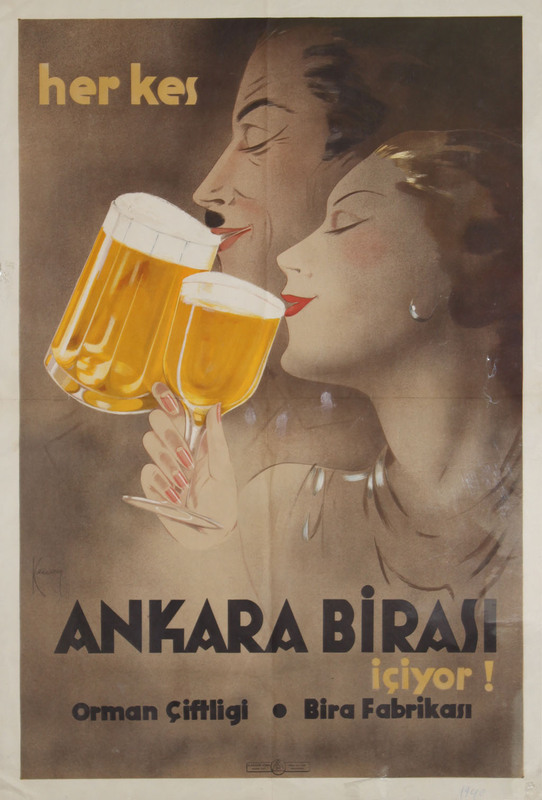 Advertising poster for Ankara Beer, 1930s. From the second half of the 19th century, beer became part of life in the big cities of the Ottoman Empire, such as Smyrna and Thessalonika. The Bomonti Beer Factory is set up in Istanbul, along with beerhouses and beergardens. These places are not exclusive to men, but become symbols of the country’s modernisation process, where women and families drink beer and socialise. Ankara Beer Factory is the first place in the capital to start beer production using modern techniques. It is set up according to orders from Atatürk in 1933, the Factory and Beer Park becoming symbols of modern life in the capital.